News broke this week that four major cancer charities are complete scams—97% of the donations they received went to lavish fundraisers and luxury goods like cars, cruises and concert tickets. While these are clearly extreme cases of horribly exploitative and illegal scams, sadly, many mainstream cancer charities take part in fruitless profit cycles that essentially exploit people affected by cancer. These organizations often partner with corporations that fuel cancer rates, effectively keeping themselves in business by doing nothing to reduce the number of people who get cancer in the first place. It’s because of this all-too-common industry-charity profit cycle that we have a strict corporate contributions policy. Here at BCAction, we refuse corporate funding from companies that profit from or contribute to cancer so you can rest assured we are always giving you independent information about breast cancer. So who can you trust? It’s a good question that we hear a lot. We rely on your support – and we’re in the middle of our spring fundraising drive. Please chip in $50 today to fund our independent, bold work for women’s health. 75% of your donation directly supports our programs. We’re working hard to make sure fewer people develop breast cancer in the first place, and that women living with the disease have better options. Our independence means we don’t remain silent about environmental injustices at the root of the breast cancer epidemic. And instead of working with corporations that cause these injustices (and then slap a pink ribbon on their products), we call out pinkwashing hypocrisy. We also provide women living with breast cancer the information they need about breast cancer screening, diagnosis and treatment – all completely free of pharmaceutical industry influence (and free of charge). On a very lean budget, we work tirelessly to ensure fewer of our friends and family members die from this disease. With more and more breast cancer charities, corporations, pharmaceutical companies and lawmakers all teaming up to put profits over public health, we have a long way to go. But if there’s one thing you know about Breast Cancer Action, it’s that we’re fearless and feisty, and we don’t back down from a fight. 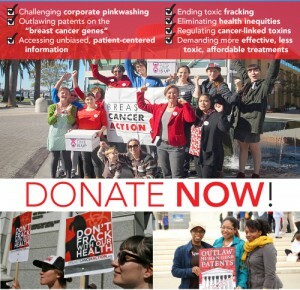 Please donate today to support our independent and fearless work for change in breast cancer.